As a parent, it is your goal to keep your children safe while also expanding their minds and knowledge. Quality and safe movies are a must for entertainment and often education. That's why we are excited to share some Reasons Pure Flix is Great for Homeschoolers! If you've heard about Pure Flix already, then you know that it is a great family friendly video streaming service. What you don't know, is that it also is an excellent resource for homeschoolers. The movie options aren't just faith-based like many assume. Instead, they are a wonderful conglomerate of documentaries, science, and more educational options that are safe for viewing by the entire family. Check out our favorite reasons to subscribe to Pure Flix for use in your homeschool classroom. Pure Flix has no adult themed undertones. 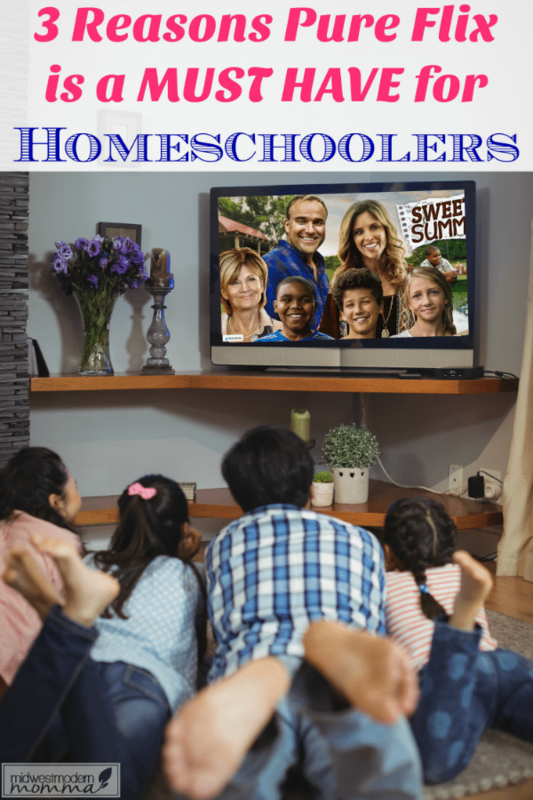 One of the big complaints of many homeschoolers is that popular documentaries often have adult themes that just aren't appropriate for all ages. While the information may be accurate, it is unnecessary to include some themes to be factual. Pure Flix offers a great list of documentaries, movies, and shows that are educational in multiple subjects without a fear of themes that aren't appropriate for your children. Pure Flix is an excellent visual learning resource. If your children are like mine, visual learning is best. Watching TV shows and movies can often them retain information faster than a lecture or worksheet ever would. Pure Flix includes tons of great documentaries and shows that appeal to children. This isn't a source of boring facts, but a place to find multiple fun and factual interpretations that are great visual options kids will enjoy. To keep the learning going after the show/movie is over, I highly recommend CommonSenseMedia.com for ideas on engaging questions. I always ask these 3 questions: What did you like? What did you dislike? and What did you learn? Science and nature: Tons of options looking at individual plants and their part in our ecosystem, animals and their habits, and natural elements that help us survive. History and geography: Ideal for safely teaching children about different time periods in history. This section includes many options regarding American and World History that will be safe for all ages, and still be fun to watch and learn from without being boring. We plan on incorporating some of the movies/shows into our Story of the World curriculum. Government: Instead of teaching children about anger in politics, you can teach them about the details of government in a fun manner. Pure Flix offers a wide variety of shows and documentaries that look at how the government works and the judicial system setup. There are also great options that look at the government and history of government in other countries that can easily be used to show the part they played in the setup of the United States. Biographies: If your children struggle with reading, a biography can be tough to manage. Pure Flix offers a multitude of visual biographies including ones on favorites like Benjamin Franklin, Henry Ford, and even a wonderful option about Betty White. The list includes great choices that are both educational and entertaining. One thing I love is that I can feel comfortable walking away from the screen and allowing my children a choice in what they watch on Pure Flix. There are no hidden categories that could lead to uncomfortable conversations or exposure to something inappropriate. As a parent with 4 busy sons underfoot as well as a full-time work at home job, it is hard to always be there to monitor everything. Pure Flix is an entertainment option that is also ideal for our classroom that I can walk away from and have no concerns. This is priceless in daily life, as well as in the classroom. Plus, I love that you can use it on up to 5 devices at once. We have a Roku TV and Fire TV/sticks for the other TVs. It also works on Fire Tablets, Android & Apple phones/tablets, Chromcast, Apple TV, and via your favorite browser. Pure Flix is a great online streaming service that is ideal for adding to our homeschool curriculum. Including an hour a day of television time that is educational is perfect for every day, as well as throughout the summer. Your children will feel like it is a special treat, and you will be happy to know you are teaching them while they have fun!